If you’re anything like me (engrossed in personal care information), you’ll start wondering about the strangest things; Things like, is the water I’m washing my face with full of bacteria. Is hot water as harsh to the hair as it is to the skin? Is my water slowly eating away at my body? OK, maybe I’m a little more weird than the average female. Still, when you are concerned about treating your body as well as you possibly can, these kinds of thoughts may enter your head (don’t front like it doesn’t LOL). Well, lately I began to think about hard water which is water that has too much calcium in it. Hair: The water causes your shampoo to leave an excess film on your hair. The build up leads to brittle hair that breaks. Having fine natural hair, I certainly don’t need brittle hair to add to my already fragile hair’s list of concerns. Skin: The water causes dry, often irritated skin along with clogged up pores. Now, of course I’m much more concerned with how hard water affects my hair. ha! such vanity. On a serious note, not only can hard water dry out your hair and your skin causing both to lose their luster, it’s just plain uncomfortable. When you wash your hair, you’re more prone to itchy scalp as well (I seriously thought I had hard water because my scalp does tend to itch a bit right after washing my hair). While New York may not be a hard water state, it’s not a soft water state either. I still feel the need to use a shower filter as I am prone to dry itchy scalp. Applying pure coconut oil or almond oil to my hair and skin definitely helps. When you’re done, come back and share! 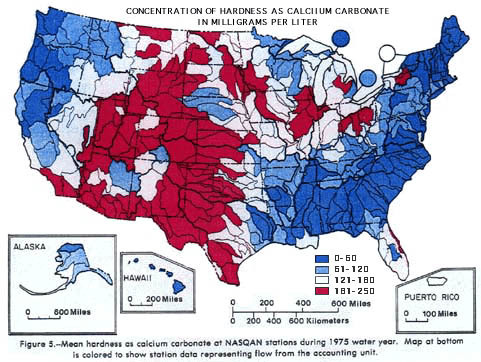 Does your state have hard water? Thank God I dont’ use well water! Thanks for sharing the info. Michael.